CSUN's Marilyn Magaram Center sells honey harvested from campus bees. Submitted photo. 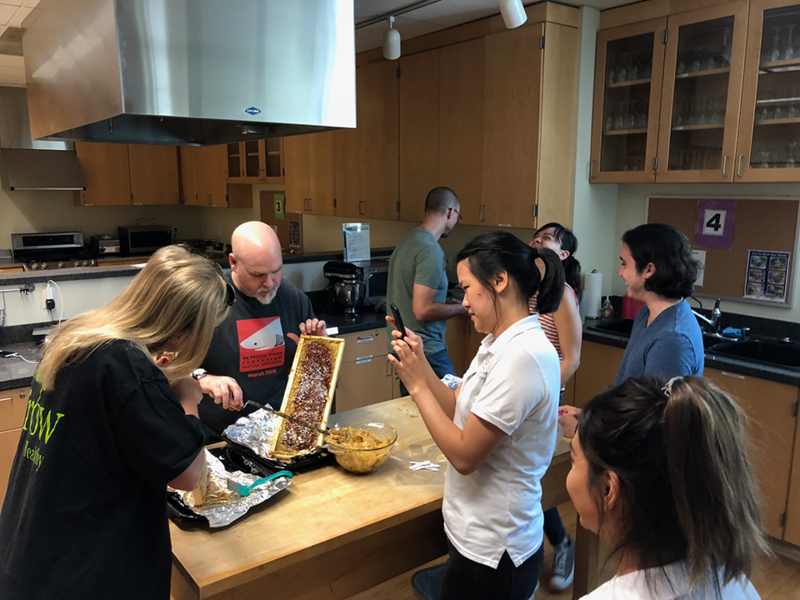 For those who care about locally sourced food, California State University, Northridge students and faculty have a sweet treat for you — honey made from bees right on campus. Scientists in the biology department studying honeybees have partnered with Family and Consumer Sciences’ Nutrition, Dietetics and Food Science students who are pursuing research and activity projects through the department’s Marilyn Magaram Center for Food Science, Nutrition and Dietetics. 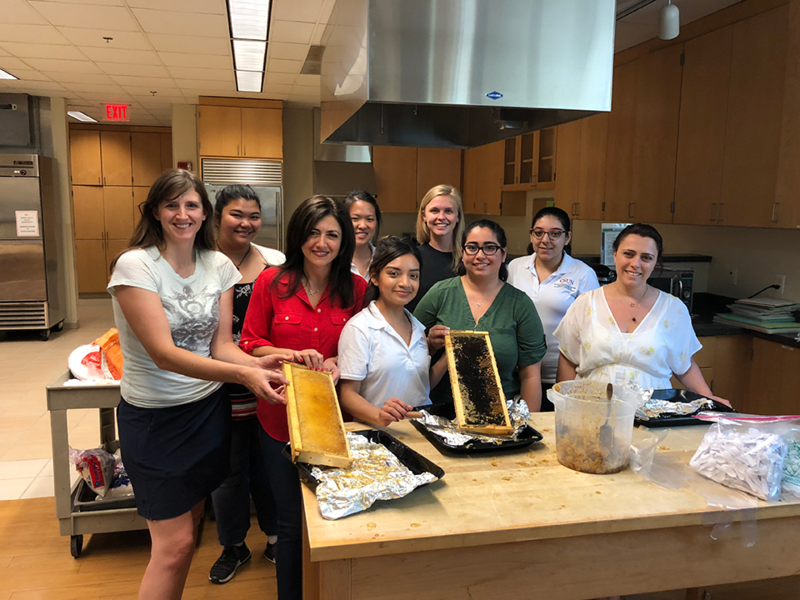 The students have harvested, processed and will sell their “Bee a Matador” wildflower honey to the campus community and neighbors later this fall. 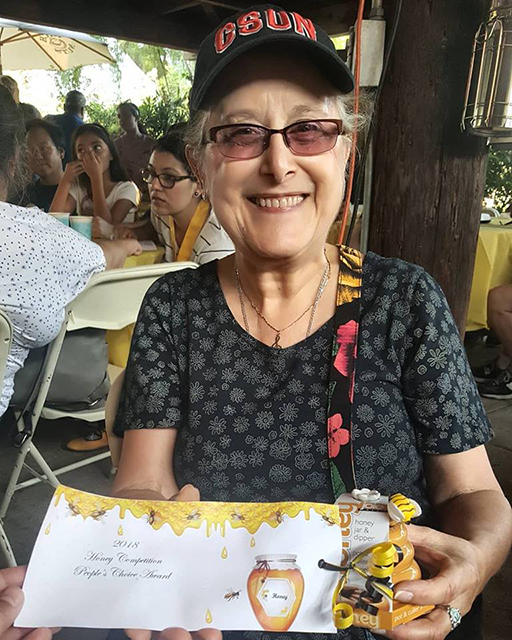 Even before their first sales, the new Matador honey label won praise: In August, “Bee a Matador” won the 2018 Honey Competition People’s Choice Award in The Valley Hive 3rd Annual Honey and Recipe Competition in Chatsworth. 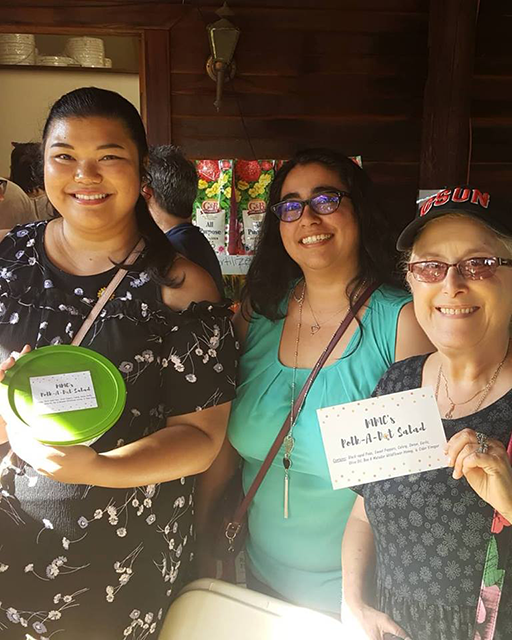 CSUN dietetic intern Eirenel G. Eclevia said she loved being part of the contest and joining the festivities in the Valley Hive competition. 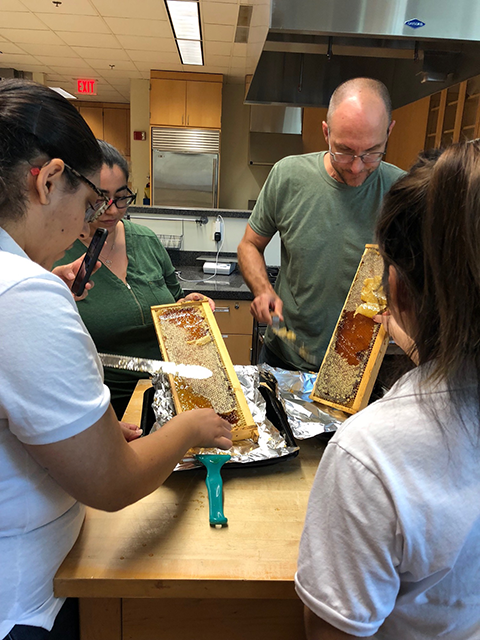 Beginning in November, CSUN students, faculty, staff and members of the community can place orders for the honey with the Magaram Center or buy it at the campus’ weekly farmers market — every Tuesday while school is in session. There are about 200 jars in production, going toward the sale at the market. Biology professor and beekeeper Rachel Mackelprang is in charge of harvesting the honey and checking on the five bee hives on campus, including one in the CSUN Botanic Garden. The hives are made up of Italian honeybees, ​which are known for being docile. The hives are surrounded by fences for extra protection and pose no threat to students, faculty or staff. Mackelprang is studying microbial communities, and she has been working to determine if microbial treatments affect the symbiotic bacteria in the bees’ digestive systems, which may negatively impact their health. In the biology department, the bee colonies serve as a resource for multiple classes — students have the opportunity to participate in the research project, visit the hives and learn about beekeeping. 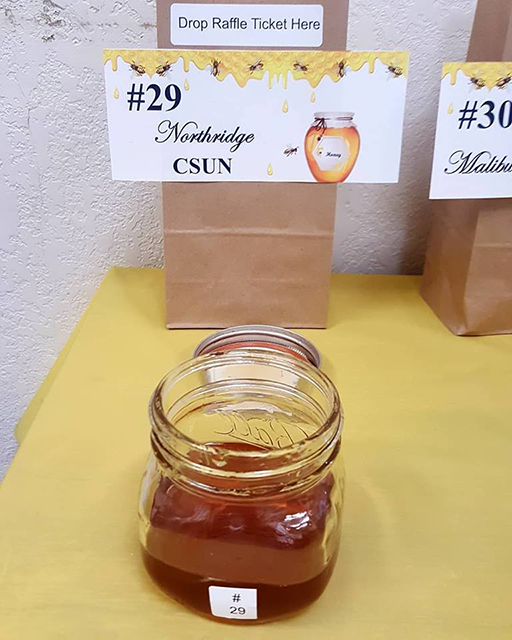 In February, the honey produced by the Italian honeybees was extracted, and the honey was bottled from CSUN’s bees for the very first time. During the second honey harvest in July, Mackelprang, her team of students and Magaram Center interns centrifuged, filtered and bottled the honey in jars with labels they designed. In total, they extracted almost 100 pounds of honey. The Magaram Center also sells “Matador Marmalade,” made from oranges in CSUN’s historic Orange Grove along Nordhoff Street, and “Spicy Matador,” a blend of spices made from herbs in the center’s Wellness Garden. “The center’s goal is to expand on our product development and internship opportunities,” Besnilian said. 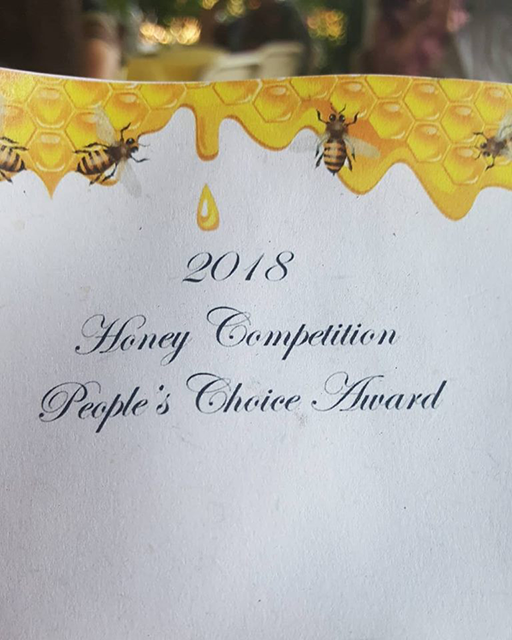 Students are currently working on the taste-testing stages for the honey and working to meet a large pre-order (they’ve completed about 40 jars). They estimated the price per jar of Bee a Matador honey will be about $10. The proceeds from the sales will help support lab research. At President Dianne F. Harrison’s Welcome Address in August, Harrison noted that the university will be working on several projects to become more pollinator-friendly, with the goal of gaining recognition for CSUN as a “Bee Campus USA.” Bee Campus USA institutions are colleges and universities (there are 50 across the country) that are ensuring a better future for their pollinators, communities and the planet. 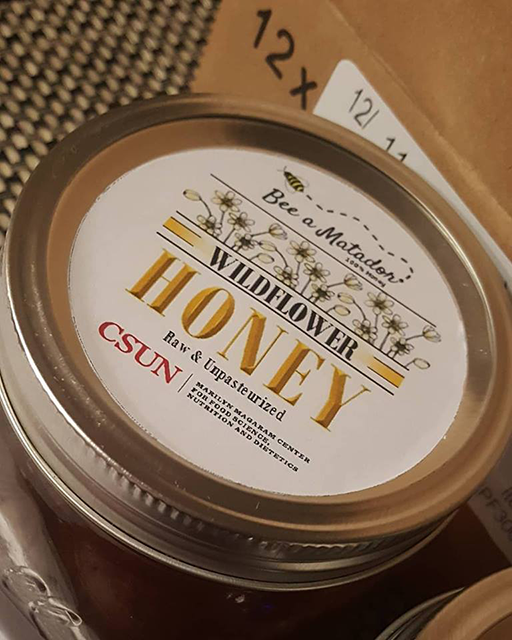 For more information about Bee a Matador, Matador Marmalade and Spicy Matador, as well as the other services provided at the Magaram Center, please visit https://www.csun.edu/marilyn-magaram-center/products-services. For more information about the weekly AS Farmers Market, please visit https://www.csun.edu/as/farmers-market.